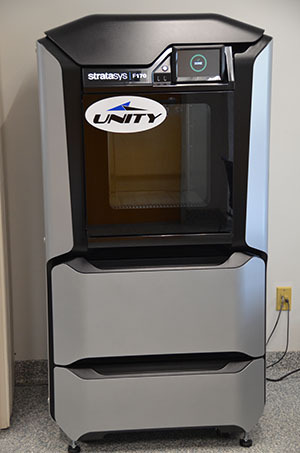 Unity Precision Manufacturing has an in-house 3D printer – the 1 Stratasys: F170 3D Printer: 10”x10”x10” Build chamber. We use this amazing cutting-edge technology for a vast number of our projects. It helps us work more efficiently, impacting positive outcomes both internally and for our clients. Our 3D printing prototype service generates a precise and tangible model of a client’s requested project. The great advantage is that we can show our clients how their parts will actually look and how they work in practice. Another use of the 3D printer is creating fixtures for our manufacturing facility. We can customize the fixtures we need to hold specific parts in place for laser pointing. This makes our production process more efficient. We don’t need to order new fixtures for each need that arises, and we can make them quickly in-house for many types of projects. Unity also uses the 3D printer to create a variety of parts used throughout our production facility. For lower volume parts, or those that help us function more efficiently, we can easily create these on the 3D printer and distribute internally as needed.